Tyrone defender Cathal McCarron has announced his inter-county retirement. The 2008 All-Ireland winner says "the time is right" for him to call time on his Red Hands career after more than a decade as part of Mickey Harte's panel. 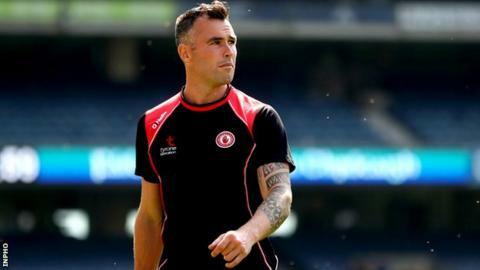 McCarron missed Tyrone's run to the 2018 All-Ireland final after he damaged his knee during their opening Super 8s win against Roscommon. "It's never easy to say goodbye, but I feel the time is right for me now," said McCarron. The veteran defender, who transferred to play his club football in Kildare last year, added: "With the injury and the travelling, it has been getting harder and harder. "I wanted to take this time to thank all the GAA community that supported me through the tough times and the good times. It's been an incredible journey and I have some unbelievable memories that I will never forget. "It's time now to sit in the stand again and watch Tyrone win another All-Ireland and more importantly spending more time with the family and enjoy some club football." McCarron, was an unused substitute in the 2008 All-Ireland final and his retirement means that Colm Cavanagh is now the sole surviving player from that Red Hands' squad. The Tyrone county board paid tribute to McCarron in a brief statement: "Cathal represented us with great dedication and distinction for many years and takes with him a wealth of intercounty experience."